We really had a fantastic trip. It was great to meet Johnny, he was a fantastic guide, great guy & I’d happily trust and recommend him to anyone. I guess from our point of view we take a gamble when signing up with guides via the internet. We had looked at a couple of websites, but didn’t really shop around a huge amount as your website was really comprensive, had all the right kind of information and technical ability required etc. Happy to say that the website is bang on. We were very lucky indeed with the weather, and the group of folk were great & we had some good banter which is always a bonus. So we loved it, had an epic time! I’m sure you’ll get very similar comments from the rest of the group, but my father and I absolutely loved the trip. Overall we were incredibly lucky with the weather and Mark was a superb guide, incredibly knowledgeable, relaxed and fun to tour with. I for one will be looking into more tours and I’d love to go on another next year. Thanks and I look forward to getting in contact again to discuss next year’s adventures! Great trip thanks Rich…. And the Guide was fantastic. Many thanks, Paul. The Haute Tour was excellent! Despite poor initial weather forecasts we were very lucky to get fresh snow and great weather until the last day. Dave was fantastic throughout the tour. He kept us safe and my future Alpine Touring will benefit greatly from the advice he frequently gave me! Except perhaps the bit about not skiing fast 🙂 I was also very fortunate to have a great group of companions to travel with and we had a lot of laughs along the way which made the whole trip even more enjoyable. Thanks again to Dave for being such an excellent guide and to you and your team for organising such a great trip. Thanks, we had an excellent time, very well organised. Dave did a brilliant job, a good balance between safety and independence, and few exceptionally good decisions – such as leading out on the Pigne d’Arolla, and calling it a day in bad weather (with a tidy bit of navigation in the fog). So all round a great trip which was also dependent on a very pleasant group of fellow travellers. Good guide in Dave: particularly liked the stress he put on certain skiing fundamentals, the importance of which was evident on many occasions. His skill in route finding, putting in the track and navigation was certainly very obvious and appreciated. I liked the challenge of trying to complete a route, which gives the whole trip a tangible purpose, though obviously means the skiing is not necessarily always ideal. Having said that I think we had great snow conditions. Also important was the make up of the group; of course I knew Rosie and Jay which helps, but the other guys were great company and I would be more than happy to join them again. Thanks for the trip, hope to see you next year! Just a quick note. I really enjoyed the trip (especially now I’ve had a day or two to recover), the whole experience was great with a variety of different conditions and uncertainty all adding to the overall sense of achievement at the end, including some great skiing thrown in! Looking forward to doing something next year, any suggestions would be appreciated! Had a fantastic time skiing last week and it feels great to have completed the route albeit with a slight variation mid-week to mitigate the risk of bad weather and avalanche potential. In fact the bad weather added a bit of character to the week… Thanks for a great trip and I’m already looking forward to a tour next year. This was a trip of a lifetime and went beyond me wildest expectations. I’ve had many guides in my mountain adventures and I would say that Dave’s performance was the best I have ever seen and enjoyed. I think the rest of the group feels the same. The trip was a fantastic success. Very pleased with everything. All the logistics went off without trouble. Even had a bluebird powder day in Zermat the day after the tour. Was very happy with Dave Hollinger. He was focused on his job as guide, to keep us safe and got us to Zermatt. He kept things fun but never lost sight of everyone’s welfare. He got us to Zermat while other teams failed while maintaining a good margin. I know that some of the success belongs to the team, but it was Dave’s ability to gauge our strength and weakness and his talent in inspiring us that helped lead to this success. Thanks for all your help answering our questions and making arrangements. Everything was first-rate. Your pre-trip correspondence, answering my numerous questions, was very much appreciated. Dave Hollinger, as you know, is a great guy and a consummate professional. Never once did I not trust his judgment and his commitment to the group’s safety. Pushing onto Zermatt the final day ahead of foul weather was a tough call, but one we all appreciated. The training day we spent with Dave was excellent. After 40 years doing this sport, I still learned a lot. The hut accommodations were fine and the food plentiful. Dave’s communication on what to expect was spot-on. We also very much appreciated the luggage transfer to the Hotel Derby. I can’t say enough about your company and the experience it provided us all. It was indeed the trip of a lifetime. For 2020 we are again offering midweek departures through March, alongside our standard weekend departures. Those wishing to join a midweek trip should arrange outward travel on a Wednesday (ski days being Thursday to Wednesday), and arrange return travel the following Thursday. 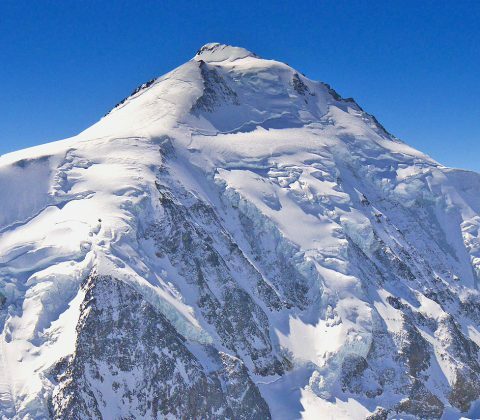 NB 2019 Season Update – Many of you will have heard about the fire at the Grand Montets ski area in Argentiere this summer, which has resulted in the closure of the 2 stage cable car for the 2019 ski season. This affects the first day of the Haute Route – ie the Grand Montets – Trient day of the tour, which usually starts with a descent into the Argentiere Basin from the top station of the GM. This year we will be taking the new high speed gondola up to the mid station, then a further chair or gondola in order to get as high as possible on the lifts, before skinning up and around to the Argentiere basin. This will add an extra hour and 200/300m of skinning to the day. Please arrive fit and well prepared and get in touch if you need further info! If you have not skied with us before, then please read our Haute Route Advice page and drop us a line before you make an online booking, so that we can advise you about suitability for the trip! The Haute Route ski tour is an intermediate/advanced level trip. To take part you should be at Fitness Level 3 and Tech Level 3 (see our Fitness/Experience guidelines below). NB Telemarkers need to be at Level 4. You should have at least one week’s previous ski touring experience on alpine touring kit. This needs to be in the Alps, or on equivalent terrain eg. in North America, New Zealand, Scandinavia etc (eg ski touring in Colorado is fine, but ski touring in the Uk is not enough) – preferably hut to hut touring, but a week’s day touring is ok. However, if you are both a stronger skier and also very fit (Levels 4+) then a shorter period of focussed ski touring prep will be sufficient, such as our ski touring skills long weekend. 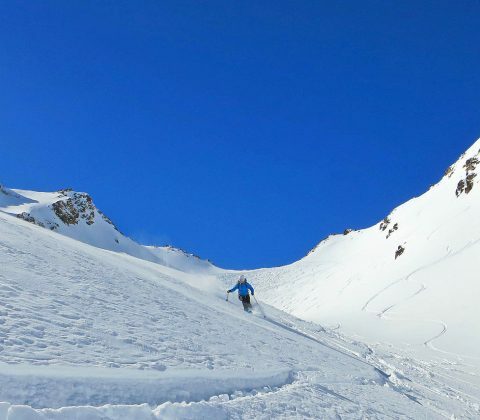 Type of ascent: we use approximately 30% uplift and 70% skinning on this tour – approx 4350m skinning up, and 7300m skiing down on the tour, plus a lift assisted day tour/off piste on day 1. Familiarity with touring kit – know how to use touring boots/bindings/skins/harscheisen and other touring kit. Skinning skills – have efficient skinning technique and be able to skin safely, including on icy traverses. Uphill Kick Turns – safe and efficient uphill kick turns on exposed, steep (up to 35deg) and sometimes icy slopes. Skiing with a rucsac – ski well whilst wearing a heavy rucsac (~8kg) containing safety and overnight gear. Confidence on steep ground – ability to boot track up steep snow, whilst wearing crampons and being tied onto a rope. Steep descents – happy being lowered down steep snow on a rope (either side slipping on skis, or on foot wearing crampons). Avalanche Awareness – must have worn an avalanche transceiver before and be aware of basic avalanche safety protocols. The Haute Route is possible on a splitboard, but being a long A to B tour, the route traverses a lot of terrain that it’s far quicker and easier to cover on skis. Using a splitboard, different techniques and lines are required on a number of sections of the route, which means we are unfortunately unable to accept bookings for splitboards on our Haute Route trips. If you’d like to do the Haute Route on a splitboard (either as an individual, or as a group of friends containing both skiers and splitboarders) then you need to get in touch with a guiding company that specifically offers Haute Route splitboarding tours. If you need any help with this, then drop us a line and we’ll give you some recommendations. A number of our other touring trips are suitable for splitboards however, so if you’d like some advice and recommendations on these, then please get in touch. 3 or 4 nights accommodation in the Chamonix valley, including breakfast. 4 or 5 nights accommodation in mountain huts, including breakfast and evening meal. Our base and meeting point is the Hotel de La Couronne in the alpine village of Argentiere, 15 mins from Chamonix. The Couronne is a friendly place in the centre of the village, close to ski hire shops, bars, restaurants and bakeries, and within walking distance of the famous Grand Montets ski area. Rooms are provided on a twin (or occasionally triple or quad) sharing basis, but if you wish to book a single room please let us know and we will confirm availability. The hotel has ski and general storage facilities, so any extra luggage can be left until your return to resort at the end of the week. Evening meals can be taken in Argentiere in the hotels partner restaurant. Hotel details can be found on our Accommodation page. For overnights in the high mountains we will use mountain huts. For more info please read the Using Alpine Huts article which provides an overview of typical facilities, average costs to help you budget for lunches/drinks and general info on hut etiquette. We will arrange any transport needed during the tour, including the return taxi transfer back from Zermatt to Chamonix – you simply pay for these items direct as we go along. For Mid Week Departures, days are shown in brackets. 2019 Season Update – Many of you will have heard about the fire at the Grand Montets ski area in Argentiere this summer, which has resulted in the closure of the 2 stage cable car for the 2019 ski season. This affects the first day of the Haute Route – ie the Grand Montets – Trient day of the tour, which usually starts with a descent into the Argentiere Basin from the top station of the GM. This year we will be taking the new high speed gondola up to the mid station, then a further chair or gondola in order to get as high as possible on the lifts, before skinning up and around to the Argentiere basin. This will add an extra hour and 200/300m of skinning to the day. Please arrive fit and well prepared and get in touch if you need further info! You should arrange outward travel on Saturday, arriving by 6-7pm latest in time for the briefing at your accommodation. Your guide will run through kit checks and safety routines, as well as hand out any rental equipment, before going on to discuss the current weather and mountain conditions and how these affect our plans. Overnight in the valley. Before setting off on the Haute Route, we do a warm up and training day – ski touring in the Mont Blanc Massif. The aim is for you to get in a days acclimatisation, enjoy some good skiing and refresh on your touring skills. During the day we will recap on skinning and kick turns, do some transceiver training and either some crampon and ropework, or glacier skiing. Each day is a little different, as we tailor the training to peoples’ experience levels, strengths and weaknesses in order to ensure that everyone is properly prepared for the trip. NB this is a refresher day, not a complete beginners training day – ie some of the skills may be new to you, but you must already be a good off piste skier and have done at least one weeks’ previous ski touring on alpine touring kit before joining the trip. From the top of the Grand Montets cable car, a great 600m descent with stunning views leads down on to the Argentiere Glacier, where skins are donned for the first big climb of the trip. The day begins with a few hundred metres of descent down the right bank of the Trient Glacier, followed by a short boot track to reach the Col des Ecandies at the top of the Val D’Arpette. If staying at the Mont Fort Hut at the end of the day, we can get up a little later and enjoy a quiet descent of the Val D’Arpette before having an afternoon’s off piste skiing around Verbier, as the Mont Fort Hut lies within the Verbier lift system. From the Prafleuri Hut, an hours skinning leads to the Col des Roux, where the long descending traverse above the Lac de Dix begins. This section of the route is south facing, so in warm weather, must be completed early in the day. At 3790m, the Pigne D’Arolla marks the highest point reached on the trip and is a wonderful viewpoint across the whole of the Western Alps. 950m ascent, 700m descent ~4hrs (1250m ascent, 1350m descent ~6.5hrs to Nacamuli). The final day of the Haute Route is always one of the most memorable days out in any ski mountaineers career – crossing three cols and six glaciers, with a final huge descent down to Zermatt under the North Face of the Matterhorn. We’ve been guiding the Haute Route for many years now and are well aware that having an extra day in the itinerary greatly increases your chances of completing the route. It makes the trip a little more expensive, but you get 7 days skiing and it’s definitely worth it if you are serious about reaching Zermatt. If we reach Zermatt on Friday, then Saturday will be a spare day to ski off piste/tour either in Zermatt or Chamonix. PM Overnight in Chamonix valley. Return travel should be arranged on Sunday morning, after your final nights accommodation. To ski the Haute Route safely and enjoyably you should be at Tech Level 3, Fitness Level 3 (see definitions below) and have done at least one weeks previous ski touring (hut to hut preferably, or day touring). If you are both a stronger skier and very fit (ie Level 4 or above for both) then, in our experience, you can get away with a shorter period of focused ski touring prep beforehand e.g. our Ski Touring Skills Long Weekend – so that we can ensure you have the necessary skills and fitness for the trip. If you are relatively new to ski touring, please read our Haute Route Advice article. What shape you are has a big impact on your likelihood of success! Eg are you slim and athletic, a normal build, a bit overweight, or 1-2 stone (7-15kg/15-30lb) or more overweight? If you are considerably overweight, you stand almost no chance of completing a big multiday ski tour like the Haute Route, even with reasonable fitness (although the two don’t usually go together), perfect weather and good conditions. If you are carrying any excess weight, then you need to lose as much of this as possible before joining the trip. If you need to top up your fitness for this trip, please see our ski touring training advice page.